The TAG Heuer Men’s WAJ1113.FT6015 Aquaracer 500 watch is a tool of ultimate precision and quality. TAG Heuer is credited with creating the most precise timepieces on the market and provides the official timing devices for a numerous official sporting events including the Olympic Games, the FIS Ski World Cup and the FIA Formula 1 World Championships. In fact, TAG Heuer created the first stopwatch accurate to 1/1000 of a second. The Aquaracer 500 is perfect for the water sport enthusiast! 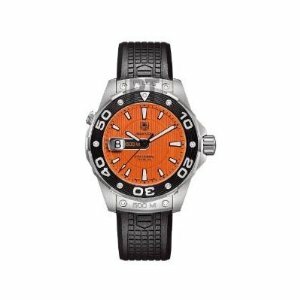 TAG Heuer is a favorite of sports celebrities and enthusiasts worldwide and the Aquaracer 500 is designed for those men who enjoy sportsmanship and competitive precision. The Aquaracer collection was designed with water sports in mind and the watch boasts water resistance up to 500 meters or 1,640 feet. This makes it suitable for swimming, snorkeling, skin-diving and diving. The bezel is made from black molded rubber on steel and includes a 60-minute diving scale. There are also luminescent markers on the hands and index hour markers making them easier to see in low light or even under water. The fact that it has a large bright orange dial with large ten and five minute markers on the bezel makes it easy to tell the time with just a quick glance at the watch. These features make the Aquaracer 500 an exceptional watch for the serious water sportsman. Despite its reputation as a ‘sports’ watch, the Aquaracer 500 is not an unattractive watch loaded with unnecessary clutter and gizmos. It has a very clean, stylish look with very little to distract on the dial apart from the clock hands, index markers, date and the TAG Heuer logo. It has all the specs of a high end watch with scratch resistant sapphire crystal and quartz movement. This watch also has a stainless steel case with a screw down case back and a rubber band with a fold over clasp with a double push button making it quick and easy to put on and remove. The TAG Hueur Aquaracer 500 looks solid enough to hold up to any sporting event yet has a simple, no-clutter style that makes it appropriate to wear for going out as well. It is perhaps not appropriate for formal and business events, but for those who engage in any sport, the no-nonsense clean dial with its large luminescent markers make it the perfect watch for ‘glance at it and get on with it’ type of usage. Good looks combined with practicality are always a winning combination.